Palavras-chave: Liderança de Equipe. Suporte Organizacional. Sucesso de Projetos. O objetivo do estudo foi identificar de forma empírica atributos importantes de liderança e da equipe de suporte organizacional para o sucesso de um projeto. Foi aplicado um questionário quantitativo via digital, através do sistema interno da empresa e e-mails, avaliando como estes atores influenciam o sucesso de projetos na AIESEC no Brasil. Foram obtidas 103 respostas de membros de 99 equipes de projeto, que foram avaliadas de forma quantitativa através uma análise univariada, de estatística descritiva. Como resultado, a liderança de equipe foi percebida pela maioria dos membros de projeto como presente em seu líder direto e nas ações da sua equipe. O suporte organizacional também foi identificado como algo positivo na AIESEC no Brasil, porém sendo necessária a evolução do modelo de capacitação. Por fim, constatou-se que a liderança de equipe e o suporte organizacional influenciam no sucesso dos projetos. Este trabalho contribui com a literatura pois foi identificado uma lacuna existente de validações empíricas de fatores que contribuem com o sucesso de projetos. Professora e Pesquisadora, UnB. Doutora em Engenharia de Produção pela Pontifícia Universidade Católica - PUC-Rio. Professor Faculdades Projeção. Doutorando em Administração pela Universidade de Brasília – UnB. AIESEC - Association Internationale des Etudiants en Sciences Economiques et Commerciales Disponível em : http://aiesec.org.br/a-aiesec/Acessado em: Junho de 2016. AUBRY, M.; HOBBS, B.; THUILLIER, D. A new framework for understanding organisational project management through the PMO. International Journal of Project Management, v. 25, n. 4, p. 328–336, 2007. BACCARINI, D. The Logical Framework Method for Defining Project Success. Project management Institute, v. 30, p. 25–32, 1AD. BAKKER, R. M. Taking Stock of Temporary Organizational Forms: A Systematic Review and Research Agenda. International Journal of Management Reviews, v. 12, n. 4, p. 466–486, 2010. BAXTER, P.; JACK, S.; Qualitative Case Study Methodology: Study Design and Implementation for Novice Researchers. The Qualitative Report. Vol.13, n. 4, p. 544-599, 2008. BECKMANN, T.; LINDEMANN, P.; STRAUBE, F. Organisational support: an empirical investigation into the effect of organisational support on the success of emerging market sourcing. Logistics Research, v. 1, n. 1, p. 27–43, 2009. BASS, B. M. From Transactional to Iransformational Leadership : Learning to Share the Vision. Organizational Dynamics, v. 18, n. 3, p. 19–32, 1990. CARVALHO, M. M., & RABECHINI, R., Jr. Impact of risk management on project performance: the importance of soft skills. International Journal of Production Research, 53(2), 1-20. 2014 http://dx.doi.org/10.1080/002 07543.2014.919423. COOKE-DAVIES, T. Cooke-Davies_2002_International-Journal-of-Project-Management. v. 20, p. 185–190, 2002. DROUIN, N.; BOURGAULT, M.; GERVAIS, C. Effects of organizational support on components of virtual project teams. International Journal of Managing Projects in Business, v. 3, n. 4, p. 625–641, 2010. EWEJE, J., TURNER, R., & MÜLLER, R. . Maximizing strategic value from megaprojects: ehe influence of information-feed on decision-making by the project manager. International Journal of Project Management, 30(6), 639- 651. 2012 http:// dx.doi.org/10.1016/j.ijproman.2012.01.004. FEDOR, D. B. et al. The effects of knowledge management on team members’ ratings of project success and impact. Decision Sciences, v. 34, n. 3, p. 513–539, 2003. FREDERICK LITTRELL, R. Explicit leader behaviour. Journal of Management Development, v. 32, n. 6, p. 567–605, 2013. GIL, A.C. Como elaborar projetos de pesquisa. 4. ed. São Paulo: Atlas, 2002. GUSTAVSSON, T. K., & HALLIN, A. Rethinking dichotomization: a critical perspective on the use of “hard” and “soft” in project management research. International Journal of Project Management, 32(4), 568-577. 2014 http://dx.doi.org/10.1016/j. ijproman.2013.10.009. HAMBLEY, L. A.; O’NEILL, T. A.; KLINE, T. J. B. Virtual team leadership: The effects of leadership style and communication medium on team interaction styles and outcomes. Organizational Behavior and Human Decision Processes, v. 103, n. 1, p. 1–20, 2006. JOHNS, T. G. On creating organizational support for the Project Management Method. International Journal of Project Management, v. 17, n. 1, p. 47–53, 1999. JONES, S.A., MICHELFELDER, D., Nair, I.,. Engineering managers and sustainable systems: the need for and challenges of using an ethical framework for transformative leadership. J. Clean. Prod. 2015. http://dx.doi.org/10.1016/j.jclepro.2015.02.009. JUDGE, T. A; PICCOLO, R. F. Transformational and transactional leadership: a meta-analytic test of their relative validity. The Journal of applied psychology, v. 89, n. 5, p. 755–68, 2004. JUGDEV, K.; THOMAS, J.; DELISLE, C. Rethinking project management: Old truths and new insights. International Project Management Journal, v. 0, n. 0, p. -, 2001. KASAPOĞLU, E. . Leadership styles in architectural design offices in Turkey. Journal of Construction Engineering and Management, 140(2), 2014. 04013047. http:// dx.doi.org/10.1061/(ASCE)CO.1943-7862.0000799. LINDE, V.J. ; STEYN, H.; The effect of a project management office on project and organisation performance: a case study. South African Journal of Industrial Engineering. Vol 27, n. 1, p. 151-161, 2016. MULLER, R.; TURNER, R. Leadership competency profiles of successful project managers. International Journal of Project Management, v. 28, n. 5, p. 437–448, 2010. MULLER, R.; SODERLUND, J. Innovative approaches in project management research. International Journal of Project Management, v. 33, n. 2, p. 251–253, 2015. PACKENDORFF, J. Inquiring into the temporary organization: New directions for project management research. Scandinavian Journal of Management, v. 11, n. 4, p. 319–333, 1995. PINTO, J. K.; SLEVIN, D. P. Critical factors in successful project implementation. IEEE Transactions on Engineering Management, v. EM-34, n. 1, p. 22–27, 1987. PRABHAKAR, G. P. Projects and Their Management: A Literature Review. International Journal of Business and Management, v. 3, n. 8, p. p3, 2009. PROJECT MANAGEMENT INSTITUTE. Um Guia do Conhecimento em Gerenciamento de Projetos - Guia PMBOK. 4a ed. Newtown Square, Pennsylvania, USA: Project Management Institute, 2008. SILVEIRA, D. T.; CÓRDOVA, F. P. A pesquisa científica. [s.l: s.n.]. SODERLUND, J. Building theories of project management: Past research, questions for the future. International Journal of Project Management, v. 22, n. 3, p. 183–191, 2004. SHENHAR, A. J. et al. Project Success: A Multidimensional Strategic Concept. International Journal of Project Management, v. 34, n. 6, p. 699–725, 2001. SVEJVIG, P.; ANDERSEN, P. Rethinking project management: A structured literature review with a critical look at the brave new world. International Journal of Project Management, v. 33, n. 2, p. 278–290, 2015. THAMHAIN, H. J. The changing role of team leadership in multinational project environments. 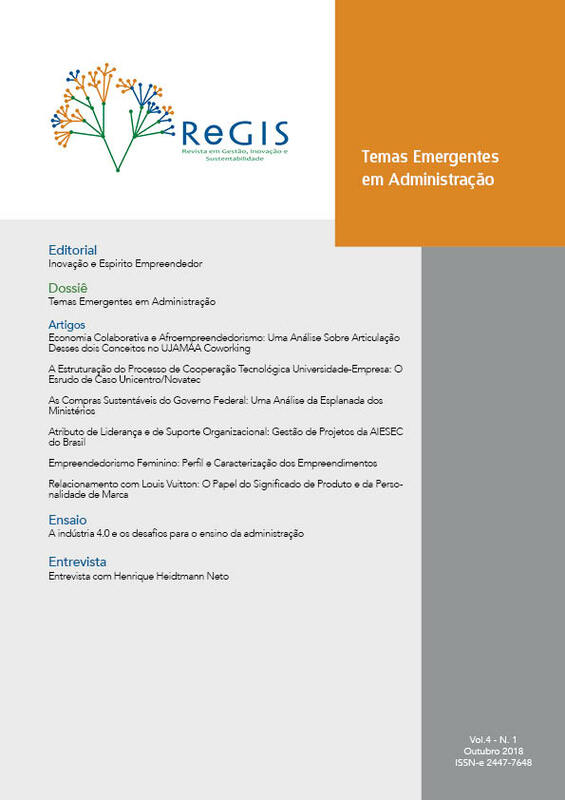 Revista de Gestão e Projetos, v. 3, p. 04–38, 2012. TURNER, J. R.; MULLER, R. The Project Managers Leadership style as a success factor on projects: A Literature Review. Project Management Journal, p. 53–61, 2005. TUULI, M. M. et al. Empowering the project team: impact of leadership style and team context. Team Performance Management, v. 18, n. 3/4, p. 149–175, 2012. Quivy, R., Campenhoudt, L. V. (1995). Manual de Investigação em Ciências Sociais. Lisboa: Gradiva. YIN, R. Estudo de caso: planejamento e métodos. 3. ed. Porto Alegre: Bookman, 2005. ZWIKAEL, O. Top management involvement in project management: A cross country study of the software industry. International Journal of Managing Projects in Business, v. 1, n. 4, p. 498–511, 2008. FRANÇA, P.; CARVALHO, J.; REIS, S.; STREIT, J. The Sustainable Procurement of the Brazilian Government: An Analysis of the Esplanada dos Ministérios. Revista em Gestão, Inovação e Sustentabilidade, v. 4, n. 1, 28 dez. 2018.